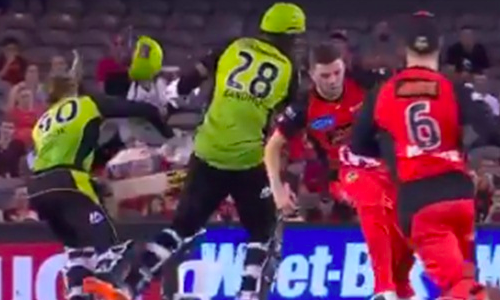 Sydney Thunder’s Jonathan Cook was run out in a bizarre fashion during a Big Bash League (BBL) match against Melbourne Renegades on Wednesday. Cook, standing at the non-striker’s end, had to rush in for a quick single after on-strike batsman Gurinder Sandhu failed to connect a slower one off left-arm fast bowler Harry Gurney in the 19 over. Sandhu took off, so did Cook, only to be involved in a mix-up as the duo bump into each other midway through the 22 years. Consequently, Cook suffered a blow to his helmet that quickly came off. Although it appeared nasty, the 29-year-old looked fine as he walked off after being run out. Earlier, Renegades rode on 22-ball 51 off Cameron Boyce to put up 140-7 in 20 overs. Cook, a leg-spinner, and Fawad Ahmed took two wickets each for Thunder. In reply, the Shane Watson-led side kept losing wickets at regular intervals as they could only manage 113 on board, being skittled out in 19.1 overs. With figures of 3/27, Kane Richardson was the wrecker-in-chief.